PayrollPanda — How to pay EIS? Help Center Home Malaysia Payroll How to pay EIS? The PayrollPanda app auto-generates the files necessary to make EIS payments online. Once you registered at Perkeso for EIS contributions you can proceed to make the monthly payments. Employers can now pay EIS online via the Perkeso Assist Portal or via iPerkeso. In addition you can make payment over the counter at a Perkeso branch office. Click here for more info on how to register for the Perkeso Assist Portal. Click on TEXT FILE, select the EIS.txt file and proceed with the upload. Note that PayrollPanda will generate the EIS.txt file upon completing your payroll. Once the file is uploaded Submit the file and complete your payment via FPX. PayrollPanda will auto-generate the the Lampiran 1 excel file once you submit your payroll. Alternatively you can download the Lampiran 1 excel file from Perkeso. Payment is made by cheque or money post. Payable to PERTUBUHAN KESELAMATAN SOSIAL or PERKESO. At the back of the cheque, put in your name, employer code, month and year of contribution and contact number. Bring the following items to a PERKESO office near you: a) Cheque or money post and b) Proof of sent email as in Section 2 above. PERKESO will provide you with a slip of acknowledgement. You can now make your EIS / SIP contribution via iPerkeso in 3 steps. 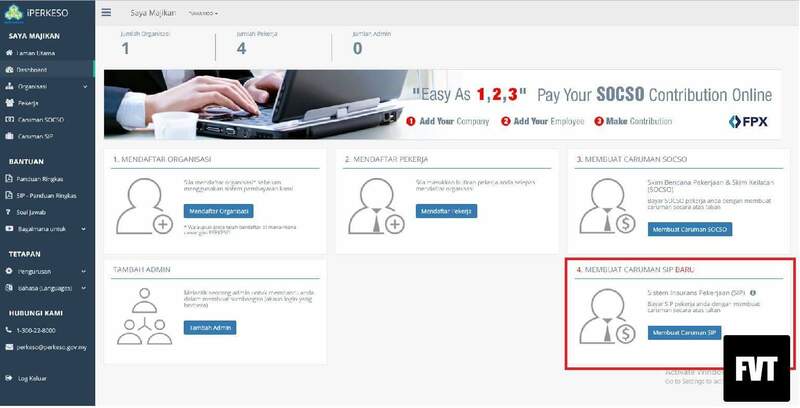 Once you login as an employer, you may go to your dashboard and click on MEMBUAT CARUMAN SIP BARU. Please refer to the following image.